As President Trump prepares to deliver his 2019 State of the Union address to Congress tonight, I want to recall a moving moment from his 2018 speech. Now Ji Seong-ho is among those who have noticed a sharp change of tone by Trump when it comes to the North Korean regime. Since Ji’s starring role in last year’s State of the Union, Trump has said almost nothing about the plight of the North Korean people, more than 100,000 of whom are estimated to be held in hard-labor prison camps. Instead, the president has abruptly shifted from a “fire and fury” condemnation of the North to an unprecedented strategy of engagement with Kim [Jong-un], which led to their historic summit in Singapore last June. Their joint declaration after the meeting made no mention of human rights, and Trump has spoken warmly of Kim since then. “We have a fantastic chemistry,” Trump said in an interview with CBS News that aired Sunday. Gone are the denunciations of the abuses Kim inflicts on his people. A second summit is tentatively booked for late February, perhaps in Vietnam. 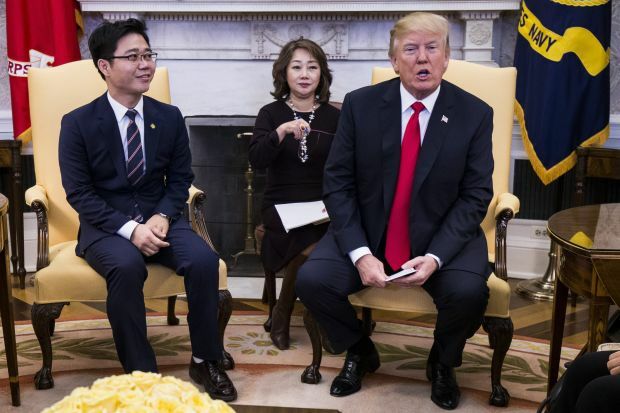 Ji and several other North Korean defectors who visited the Oval Office a year ago remain uncertain whether their partnership with Trump will lead to the human rights improvements that they have sought. I suppose a case could be made (although I wouldn’t care to make it) that progress on the promised denuclearization of North Korea is worth the price of sickening flattery of a brutal dictator and more important than denouncing what is surely the most barbaric regime on earth. But there has been little sign of progress since Trump’s meeting with Kim Jong-un in Singapore last June. At their first meeting, Trump and Kim signed a vague agreement that committed the two countries to continue working toward denuclearization of the Korean Peninsula — but with no explicit obligation by North Korea to actually disarm. The North has since claimed it destroyed missile engine and nuclear test sites, but it hasn’t let international inspectors verify that. There have been no signs the secretive state has made any movement to destroy its weapons stockpile, and in fact, some experts believe it has actually expanded a key long-range missile base and worked on construction at a nearby newly discovered missile facility. While the North has yet to test another missile or nuclear weapon, Vice President Mike Pence acknowledged on Jan. 16 that the country had taken no “concrete steps” to dismantle its nuclear weapons program. Top U.S. intelligence officials said on Jan. 29 that Kim’s regime still saw nuclear weapons as vital to its survival and that it was “unlikely to give up” its arsenal. “North Korea has given us little indication that they have yet made the decision to completely dismantle and destroy that capability,” the United States’ special representative for North Korea, Stephen Biegun, said on Jan. 31. I hope the second summit scheduled for later this month produces something more tangible. And I think Trump made the right decision to recognize Juan Guaidó as interim president of Venezuela. But, as with Saudi Arabia, it seems Trump’s concern for human rights is purely transactional.